We’re thrilled to report that between Boardwalk Empire and the upcoming release of a new The Great Gatsby movie, fabulous 1920s style has come roaring back. After all, any era in which jewels, feathers, flowers, beading and fringe are de rigueur is a wonderful thing, especially when it comes to weddings. 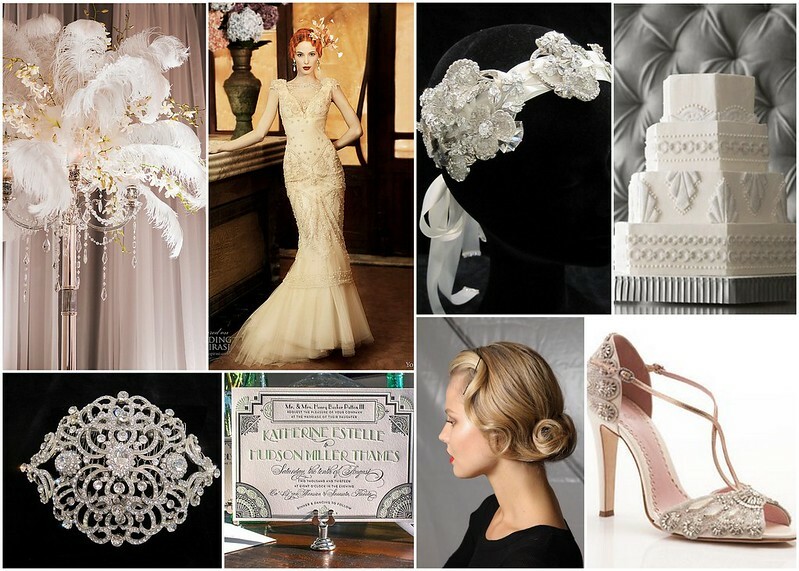 Lately, lots of women have been asking for bridal accessories inspired by the age or flappers, Art Deco and Art Nouveau, so we thought we’d share the Twenties inspiration below. Go glam with a bridal gown whose silhouette is spotlight ready, and slip on some glittering shoes. 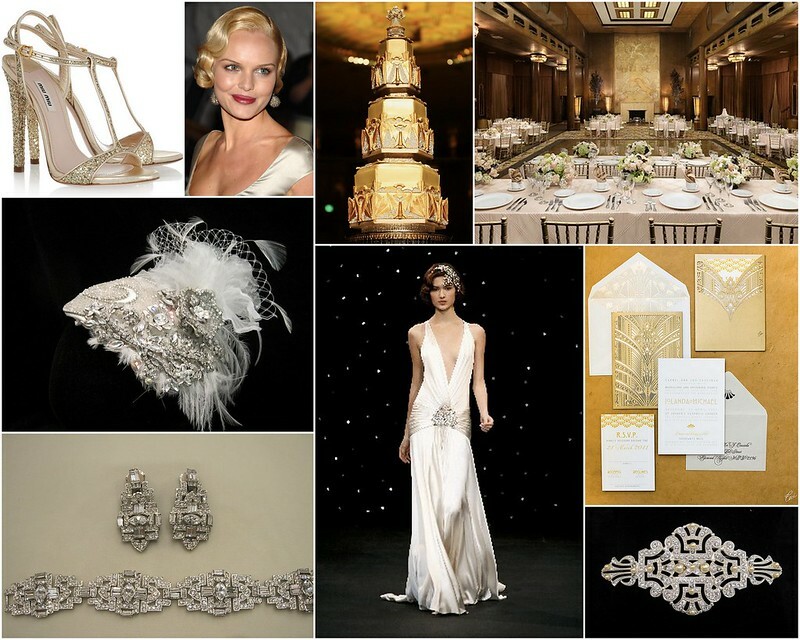 Pair the look with Art Deco bridal jewelry and a vintage-inspired bridal cap or crystal-encrusted comb and you’ll be ready dance to the Charleston all night. Echo feminine, flapper style with a beaded bridal gown and shoes that reflect an Art Deco design sensibility. Accented with a luxe bridal headband shimmering with crystals and silk flowers or a crystal hair accessory and a post-wedding speakeasy stop is a must. If polished luxury is what you’re after, think 1920s socialite. Start with a simple, sophisticated gown whose Jazz Age silhouette is enhanced by a delicate lace caplet. Add a pair of gorgeous peep-toes, dazzling Art Deco jewels and a bridal headband festooned with crystal-centered silk flowers and you’ve got a look a ‘20s heiress would love! 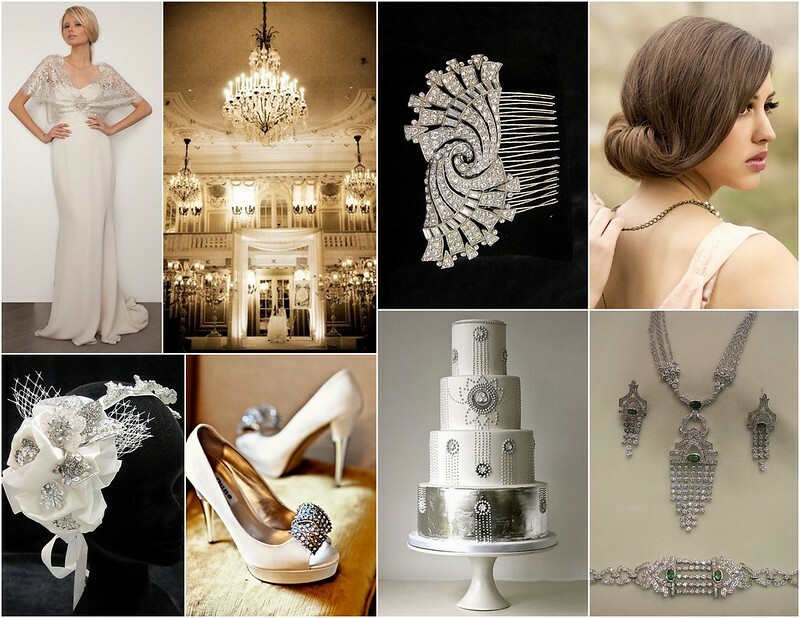 To find the perfect 1920s-inspired Art Deco bridal accessories for your wedding day, visit us at Bridal Styles Boutique. This entry was posted on Wednesday, December 5th, 2012 at 11:18 am	and is filed under Inspiration. You can follow any responses to this entry through the RSS 2.0 feed. You can skip to the end and leave a response. Pinging is currently not allowed. If you’d like to credit the amazing artist that created the gold cake in the top collage, she is Ileana Saldivia of Sugar Realm, located in Cincinnati, OH.